When I was a young girl, we always worked hard and played hard. Work always came first. Well, we thought it was work back then. Now that I am older and can reflect back on that time of life when I was young and living at home, I have come to realize that the work we did was really just being a family and doing what it took to make ends meet while having a good time. In the South there are strong family ties and strong family traditions. In my family, round about the 4th of July, that meant the corn would be coming in. 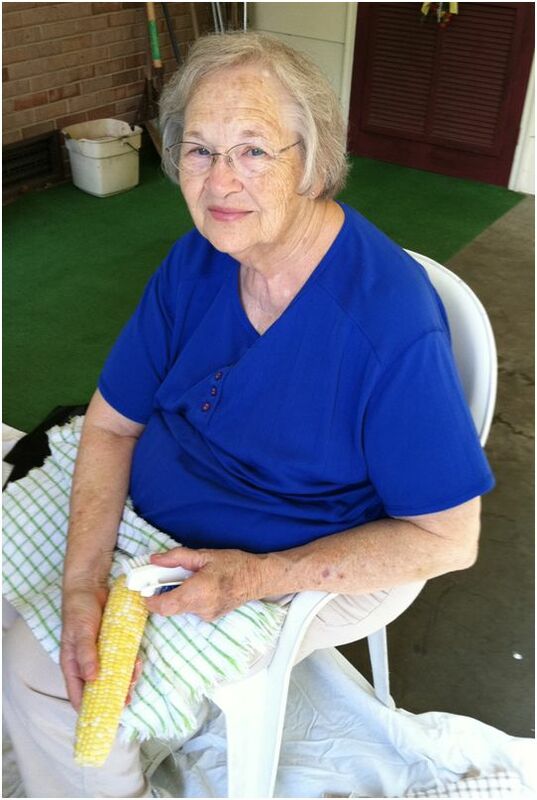 Now, I cannot convey to you how much my Momma loves corn. That means that we always put corn up in the summer. 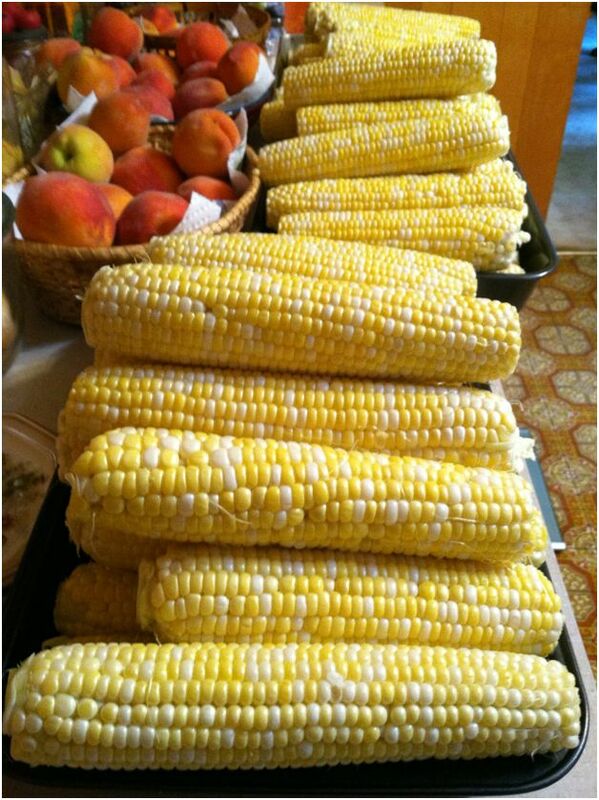 When all of us kids were home (3 boys, 1 girl – that’s me) we would sit around a big ‘ol pile of corn and shuck it under the trees. We would put the shucks on a sheet and then give them to the horses. I think the horses liked corn shucking days the best! Well, with three brothers and fresh corn, that meant there were worms being flicked on each other. Big, nasty worms. Still hate that part of corn, but I am willing to get past them to get to the sweet goodness of fresh picked corn from the field. After the boys left home, I can remember many an hour Daddy and I would sit under those shade trees and shuck corn. Momma would be in the kitchen silking, cutting off, blanching and getting it ready for the freezer. Those were days I cherish. The every day, mundane things that once someone is gone, you miss terribly. It is not the big vacations, the big events, it is the regular things of living life, that you miss when your loved one is not there beside you anymore. Enjoy your life – even the chores you hate now, but will fondly remember when your Daddy is gone. Well, this is a food blog, so let’s get on with it! Well guess what? Mom and I did corn yesterday! We only did 6 dozen, not the 12-15 we used to do when Daddy was alive, but I think it was enough for the two of us. We are very fortunate to have wonderful family friends that are willing to share their bounty. You gotta have things set up just so. You want to be comfortable. 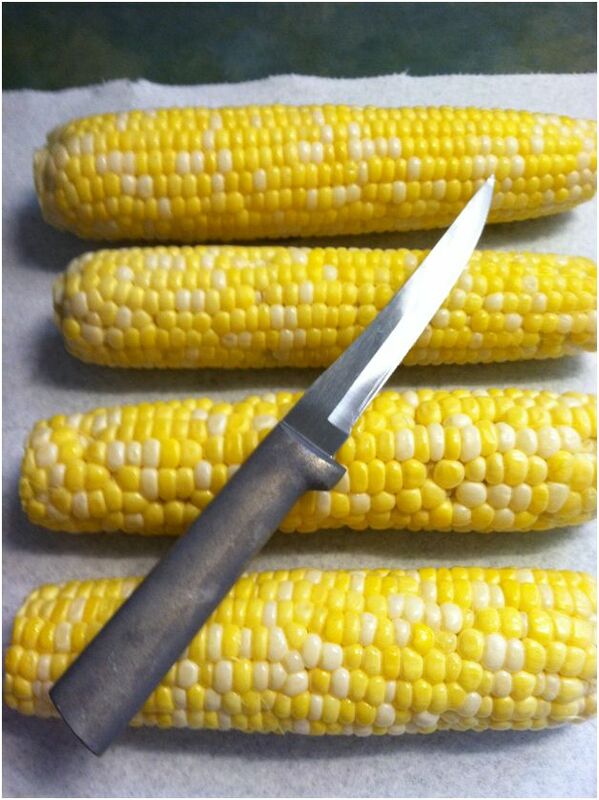 Oh, I forgot to tell you, that shucking corn is more about talking and sharing things than the actual work. Around here, folks gather and help each other out, whether it be shucking corn, shelling peas, or snapping beans. That is what happens in the South – love woven into work. Well, I had the best time sitting with my Mom. We talked about all sorts of things and just enjoyed each other’s company. I shucked the corn, and being the expert silker she is, she got the brush and got to work. She always says, “The person who eats the most corn, eats the most silk.” We always laugh at that one because she does a very good job. 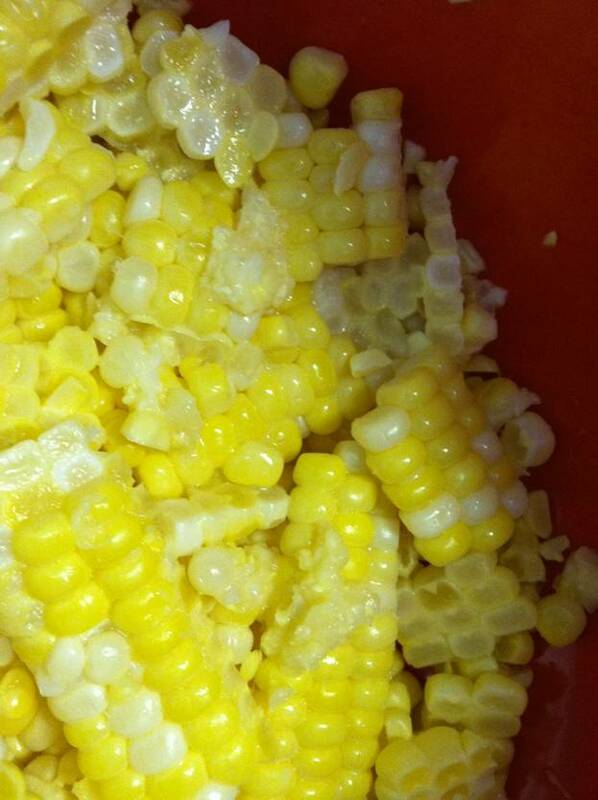 Besides, what fun is eating an ear of corn if you don’t have to pick the silk and kernels out of your teeth? Just kidding – don’t want you to think we haven’t any manners. Love my Momma! Yep, we got fresh peaches too! 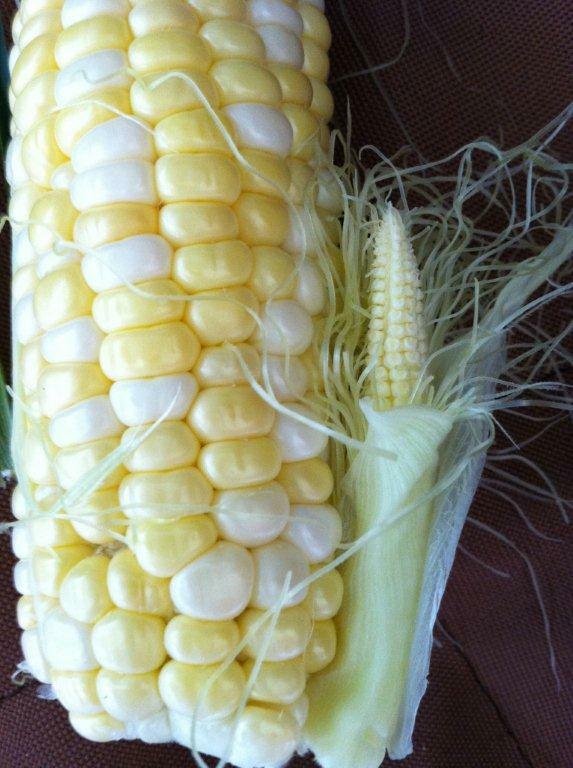 This corn is called Pearl and Honey. It is the sweetest corn. I wish people would try something other than Silver Queen. But, people seem set in their ways sometimes. 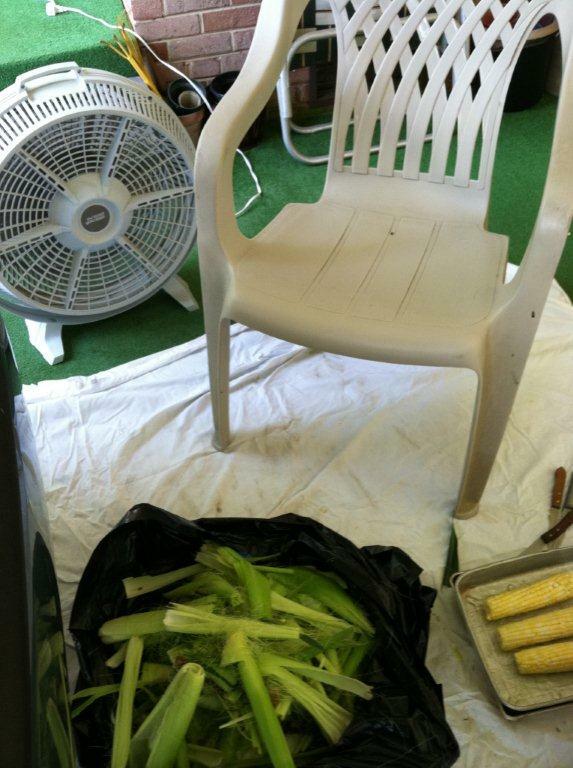 Well, we got all the corn shucked, silked, bagged and put away. Now what to do? There is never a summer that I cannot remember Momma making a big ol’ batch of Corn Fritters! They are my favorite. 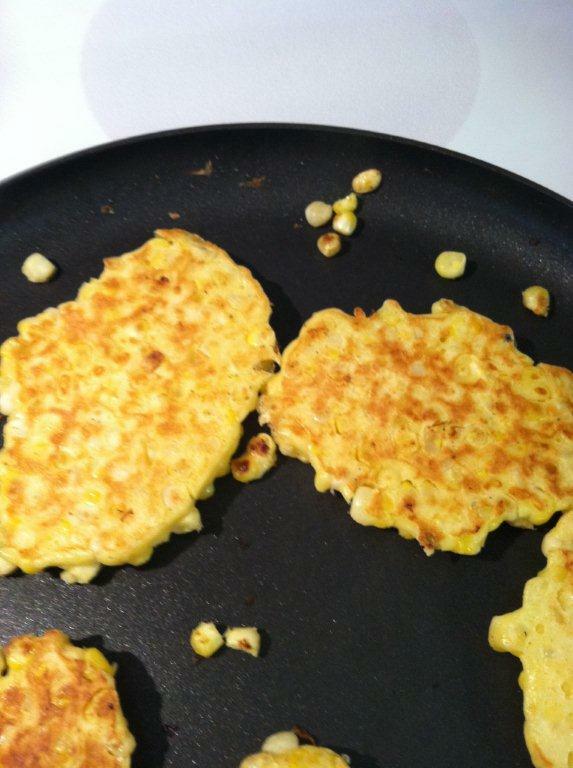 We had corn on the cob last night, so I was thinking how good some Corn Fritters would be. Now mind you, I hate when people say that everything is fried in the South. Don’t get me started on that one! (Don’t want to embarrass Jennifer) So these are not fried in grease. Just so you know and don’t get your hackles up about something being fried. 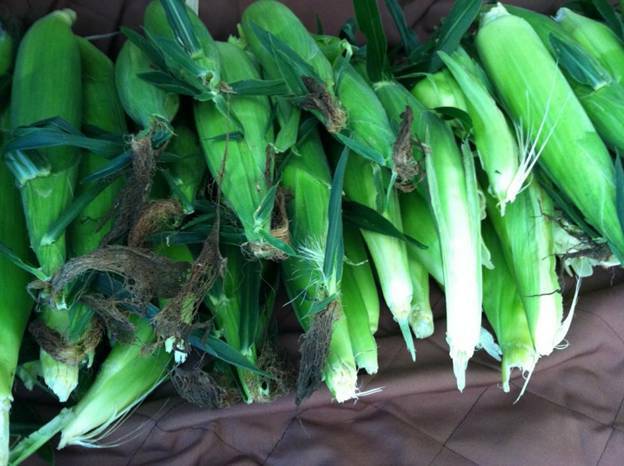 For this batch, I used 4 ears of corn. This is a good time to use those ears of corn that you think might not be pretty enough to feed company. You know, the ones whose kernels aren’t in perfect little rows. Still good and sweet, but we always want to impress company with our best around these parts! That knife is one of my trusty RADA knives. You can keep your fancy knives. This thing is sharp! You can get them through fundraisers at churches and things like that. You could probably order one off the internet, but why not just help out a local church or organization? Well, cut the kernels off into a good sized bowl. Now don’t worry if you get corn milk all over you, just wash it off or you will get sticky. 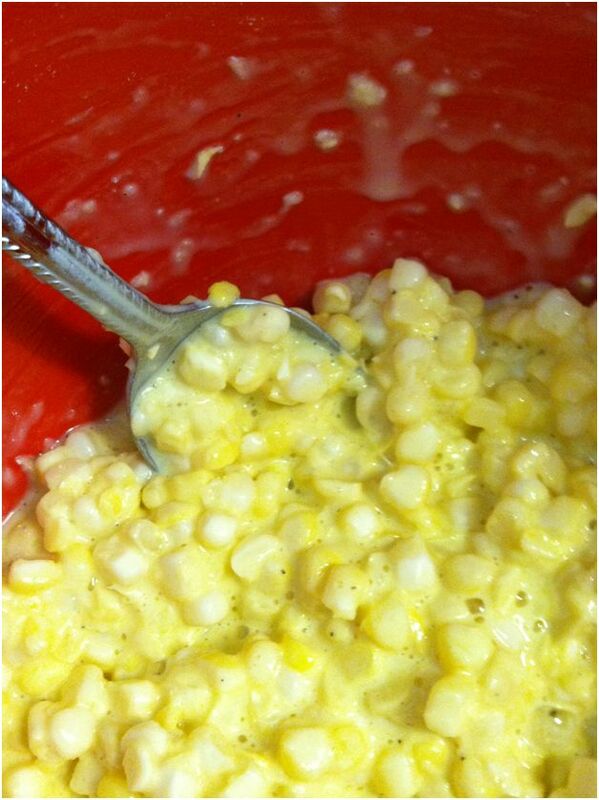 After you cut off the corn, be sure you scrape down the cob to get every last drop of the sweet, sticky goodness. Now, you need plain flour (don’t you like my fancy flour thing? ), eggs, salt and pepper, along with some milk. We only had skim, I don’t think the corn minds. (Looks like I need to go buy some more!) 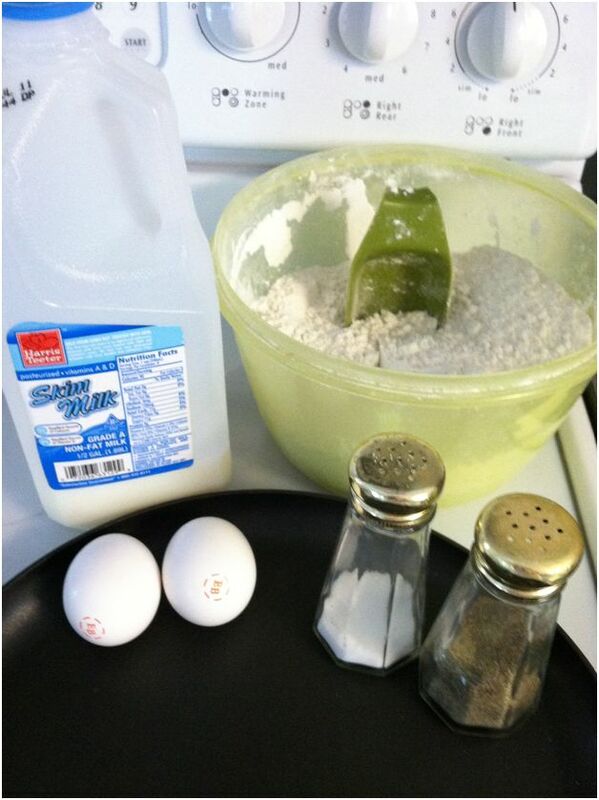 I used 2 eggs, about ½ cup of flour, salt and pepper, and a dab of milk. Always crack your eggs in a separate bowl in case something goes wrong there. (Shell or bad egg) I got a little piece of shell the first one I cracked.….that would not be a happy for the person that bit down on their fritter if I had not seen it. (If you use the shell half, it is real easy to scope out the little piece – just a tidbit of experience there.) I put the eggs over to the side so I can kinda beat them a little before mixing everything together. The idea is to have just enough batter to hold the corn together. We’re not making corn pancakes here. It is kind of a gloopy sort of thing. Sticky – yeah, that’s it. Sticky to make the corn kernels stick together. Alrighty then, now heat up your nonstick skillet (remember – we are not frying). You can spray it with Pam if you need to. I sprayed mine the first time, then just wiped it off before the second batch. I heated it to medium high. Let your skillet get good and hot. This helps keep your batter from sticking. Now, drop blobs (that is a technical measurement there) on your skillet. Let them sit there a few minutes, and when you start to smell the corn, then check to see if they need turning. If you learn to cook by your nose, you won’t even need a timer! When they are browned to your liking, turn those babies over and kinda smush them down a little. Don’t be alarmed if some of the kernels come loose from the batter. They are the teenager kernels and are just trying to be rebellious. (No reflection on Jennifer of course!) hahahaha!!! They will be so good as little roasted kernels when you finish. Be careful to get them out though, they can pop on you and let me tell you, they are hot! When you take them off the skillet, put them on a plate and slather them with butter, margarine, or if you are like me, Brummel and Brown. You gotta eat one while the others are cooking. It is a rule. (Well, I made that rule up, but it sounds good to me and I am the boss in the kitchen! She says as she winks and smiles.) 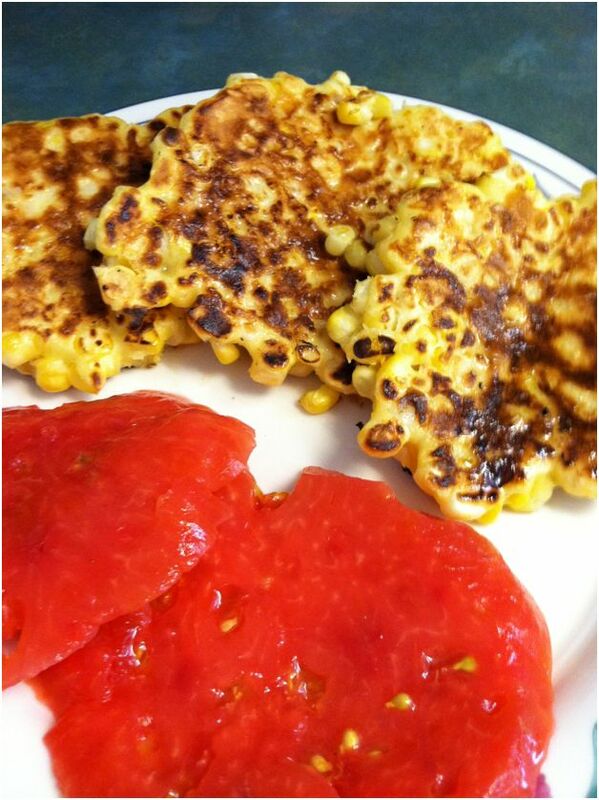 Now, when you are all done, wash up the dishes, (yes, just do it – you will be glad later on..) get your plate out, lay you a few Corn Fritters on your plate along with a nice, red, juicy, German Johnson ‘mater slice. Now THAT’S some good eating! My darling daughter, Jennifer, I just want to say, I love you. Thanks for letting me share my Southern love of cooking with you. Next Post Do failures actually exist in the kitchen??? I sure did miss Momma today when I did corn. It has only been 7 months since she left us and it is still too sad at times.